The city sells one in four towed vehicles. It pays a contractor with residents’ cars, yet the city... barely makes money. West of downtown Chicago, on any given day, at any given hour, people arrive at a massive car lot — a sea of vehicles backdropped against the gleaming skyline. Parades of motorists get dropped off by cabs, ride-shares, or family members and friends. Many of these Chicago car owners are tired, upset, and even angry. They enter a trailer near a gated entrance off North Sacramento Boulevard. Let in, they search for their cars in a lot so long — more than half a mile — that city workers usually navigate it by car. For decades, Chicagoans have retrieved their cars from this city auto pound. A trip to the Sacramento lot (or the city’s four other auto pounds) is practically a rite of passage for city car owners — a shared experience of being caught in infractions such as double-parking, leaving a car in the same street space too long or parking on the wrong stretch of road in the winter. 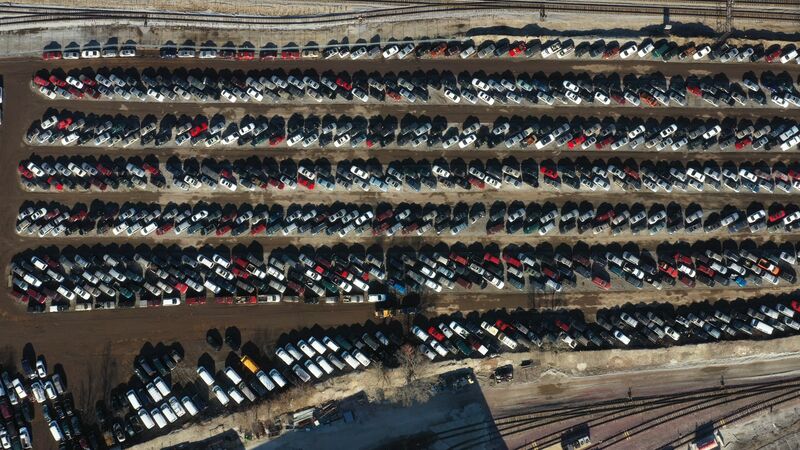 Vehicle owners experience the city’s towing and impoundment programs individually, a vantage that obscures bigger truths about Chicago’s ticketing, towing and fee-collection practices, such as: One out of every four cars in this vast lot will never make it back to its owner. Chicago sold nearly all of them to a private company, some for as little as $143. WBEZ has scrutinized Chicago’s towing practices for more than three years, uncovering disturbing truths about them along the way. We’ve examined hundreds of thousands of towing records, more than a hundred invoices, vendor contracts and internal documents obtained through more than 100 public records requests. What we’ve found paints an alarming picture of a decadeslong, practically for-profit program that embroils tens of thousands of cars from residents in Chicago and its surrounding suburbs. This expansive system is also founded on questionable public policies and executed by a private towing contractor long-tainted by scandals. More troubling, the financial sustainability of Chicago’s towing relies largely on squeezing huge sums of money from communities that have the least ability to pay. Lawyers — emboldened by recent court decisions — are now taking notice. WBEZ is the first to compare notes and trends across several city departments. It’s the first big-picture look at the system at this scale, and many of the conclusions have surprised staff at those agencies. To gauge the scope of Chicago’s towing program, we examined every tow that went through Chicago’s six impound lots in 2017, and where the vehicles wound up. If you’re not familiar with how cars end up in the city auto pounds, here are the basics. Some cars are immediately pulled off the street for, say, double-parking and head directly to the pound. In other cases, say, when a driver owes a lot of ticket debt, the city boots the vehicle on the street. If the driver doesn’t pay up on time, the boot’s taken off and the vehicle’s towed to the impound. According to our analysis, Chicago impounded 93,857 vehicles that year. It sold just under 24,000 of them – or an average of 66 cars a day – each for less than $200. The vast majority of cars were sold off to a single towing contractor, United Road Towing. Hazards and abandoned cars accounted for about one-third of impounded vehicles, but the majority of tows (and many of the eventual car sell-offs) are associated with practices that are in themselves suspect or problematic. A WBEZ investigation found the city sells thousands of vehicles belonging to scofflaws — drivers who owe money to the city for tickets. None of the proceeds go toward paying off the debt the vehicle’s owner accrued during ticketing, booting and towing. Chicago sold more than 8,000 cars from scofflaws in 2017. For context, that’s an average of about 22 cars a day. Advocates say this practice deprives low-income residents of transportation and access to jobs. “Taking away people’s transportation is a job-killer,” said Eric Halvorson, a policy and communications associate for the Chicago Jobs Council, a nonprofit employment advocacy group. Chicago’s winter parking ban prevents motorists from parking on nearly 100 miles of city streets from 3 a.m. to 7 a.m. between Dec. 1 and April 1 — whether or not there’s actually snow to be plowed. The winter parking ban was originally billed as an emergency preparedness measure, but it’s also a program that has little reason to exist. It’s also a baked-in cash cow for United Road Towing. Previous WBEZ investigations have shown the city likely loses money on enforcing the ban, and residents are actually more likely to be towed on days when it doesn’t snow. The nearly 40-year-old policy has never been studied (some tried), and the only time it was updated was to remove portions of it from some North Side neighborhoods in the 90s. Those lakefront neighborhoods have mostly white residents and higher rates of income. Chicago is the only major U.S. city that deals with snow and has a blanket parking ban. Even snow-packed Minneapolis and Milwaukee avoid such blanket bans. According to invoices obtained through public records requests, United Road Towing’s most profitable months are during the winter because the ban drastically increases the flow of cars into city impound lots – jumping 30 percent from November to December. Most of the 10,000 vehicles scooped up annually by the winter parking ban pay the required $150 tow fee and reclaim their vehicles. But in 2017, 142 vehicles were never reclaimed and sold as scrap. Chicago has a program to automatically impound vehicles used in the commission of some crimes, including possession or use of illegal fireworks, solicitation, possession of drugs, driving under the influence, driving on a suspended license, or even littering or playing loud music. Often, these drivers are never charged with a crime, but can still be stuck with thousands of dollars in fines and towing and storage fees. This program is not the police department’s asset forfeiture program — the official process police use to seize property of alleged criminals. Rather, Chicago’s VIP towing system runs parallel to the criminal justice process. The police department initiated more than 22,000 VIP tows in 2017. The vast majority involve police stopping drivers for suspended licenses. Many of these suspensions are likely from ticket debt. The fees are so high that many lose their cars to the VIP. Of the VIP cars towed in 2017, the city eventually sold 8,295. Suspended licenses were involved in 6,293 of these sales. One problem with the VIP is that it hits Chicago’s West and South Sides particularly hard. Trust between residents and the police enforcing these ordinances has broken down — the addition of lingering costs to infractions that are ultimately not prosecuted in court doesn’t help. Here’s another problem: The vehicle impoundment program could put the city at legal risk. Sam Gedge, an attorney for the Institute for Justice, helped litigate Tyson v. Timbs, the recent U.S. Supreme Court case that declared a low-level drug offense in Indiana violated the Eighth Amendment’s prohibition against excessive fines. “It really raises awareness of an issue that a lot of people in the criminal justice system are already aware of: Namely, the danger that economic sanctions like fines and forfeitures has this built-in incentive whereby the government has this kind of hydraulic pressure to take property, take money and not necessarily to do justice, but rather to bolster their own budgets,” Gedge said. While the definition of “excessive” could ultimately embroil the city in a legal debate, fines and fees for VIP tows keep mounting; in 2017 they stood at more than $28.4 million. As of today, VIP debt is larger than what residents owe for building code violations or unpaid water bills. Many VIPs have accrued storage fees in excess of $10,000, and some as high as $30,000 - $40,000 – in addition to thousands in interest and collection fees. Chicago towing operations are managed by United Road Towing, a private contractor. In 2016, Chicago gave them a contract to handle that work, at the estimated cost of $60 million over five years. URT has held towing contracts with Chicago for the last 30 years (under the name Environmental Auto Removal until 2006), despite the fact that it’s dodged many scandals. In the ’90s, the company was found to have bilked the city for $1 million. It’s been probed by the FBI in an interstate auto-theft ring. It once declared bankruptcy to avoid paying a $5 million settlement after the company was found to be illegally towing cars in another state. In 2004, the Chicago Sun-Times investigated the company, finding that it and the city sold off more than 70,000 cars in one year. Despite the bad rap, URT was tapped in 2010 to once again be the city’s towing contractor — even though it was not the cheapest bidder. According to a 2010 request for proposal and bids made at the time, San Francisco-based Tegsco (aka AutoReturn) was willing to charge the city less per towed car than URT. The city had never publicly released these bids before WBEZ spent months requesting them. A heavily-redacted, 77-page URT bid and a barely-redacted 647-page bid from Tegsco show key differences. Tegsco proposed charging the city $102 per towed car. URT redacted its fee proposal, but in 2010 it was eventually awarded a contract that charged $104.55 per tow. Inquiries to Tegsco representatives were not returned. Representatives from United Road Towing did not respond to months of inquiries from WBEZ concerning the city’s towing program and the towing contract. The city, however, defends the URT contract. The city maintained that Tegsco relied too heavily on subcontractors, even though URT relies on dozens of smaller towing companies. The higher “per car” rate is not the only issue with the current URT contract. The company’s real windfall comes in the form of junkable or sellable cars, because the contract essentially lets the company keep many cars that owners don’t reclaim from city auto pounds. Here’s how that works. In 2017, the city would pay URT $123.21 for tows involving road hazards, VIP tows, and tows from the snow ban. Car owners reclaimed most cars swept up in those programs. But for every boot-and-release tow in the scofflaw program, the city paid a lower rate — just $35.44 per tow. The city also got a $15 credit for every abandoned car taken off the streets; the company charges nothing for towing these cars. The lower rates are because of an expectation that thousands of cars involved in these kinds of tows will never be reclaimed, and that URT will take possession of them after paying the city nominal scrap prices. In other words, Chicago has long known that it tows enough cars that it can pay the towing company with some of them, potentially lowering overall towing costs for the city. The payoff for URT is huge. Of the 93,857 cars towed in 2017, residents did not (or could not) reclaim 32,155 of them. URT took possession of nearly 24,000 of the towed cars, paying the city just more than $4 million in scrap prices. But conservative estimates suggest the cars’ value was far higher. We obtained vehicle identification numbers and the make, model and year of cars sold to URT in 2017. We then looked up similar cars’ values compiled by the National Automobile Dealers Association, which supplies car values in asset forfeiture cases, according to the Illinois State&apos;s Attorney Office. We assumed the cars were in rough condition and had been driven 15,000 miles for each year they were on the road — well over the national average of 12,000 miles per year. NADA returned data suggesting that the low-value (rough) trade-in value of cars sold to URT in 2017 topped more than $22 million. The office of the Illinois Secretary of State confirms these cars are issued salvage or junking certificates. Cars to be sold back to the market receive a rebuilt title, which often (but not always) lowers a vehicle’s sale value by as much as half. Either way, the city is sending URT between $7 million and $18 million dollars in sellable cars. The contractual arrangement divvies tens of thousands of Chicagoans’ cars between the city and URT — the city gets scrap values, and URT gathers millions more in potential resale value. The remainder of the cars’ full value evaporates into bureaucratic thin air, because of the legal change in title when the car is not claimed from a city auto pound. And these are not all junkers. Sales included: a 2016 Ford Mustang for $176.09, a 2014 Audi A3 for $147.15, and a 2011 Mercedes M-Class for $143.33. Recall that when tens of thousands of cars are transferred to URT, the car owners receive nothing, and are likely stuck with ticket debt, in addition to boot, towing, and storage fees. 83 percent of what Chicago makes from towing goes back into costs. There are many problems surrounding Chicago’s towing programs: There are questionable public policies, the annual number of drivers who lose their cars is equivalent to the population of some small cities, and the contract at the center of the programs deserves scrutiny. Despite all this, the city must make money from its towing programs, right? Arriving at an an answer is not easy. The towing and booting programs are so complex and spread across so many departments that the city barely understands the scope and the bottomline. Ours is among the first assessments that looks at financials underlying the entire system. But there is an answer and it’s this: Chicago makes little money from its towing and booting programs. In 2017, Chicago pulled in $27 million from tow fees, storage fees, and scrap-price sales to URT. It spent more than $22 million, or 83 percent of that revenue, just to run the programs. It makes about $4.6 million dollars, less than what it takes in from the plastic bag tax. We arrived at these figures by analyzing city invoices, payments, contracts and the mayor’s 2017 budget appropriation data. We supplied our findings to the Mayor’s Office, Department of Finance, and the Department of Streets and Sanitation months ago. None refuted the findings. When it comes to spending, the towing contract is an enormous expense, but it’s closely followed by $7 million spent on salaries, overtime and pension contributions for impound employees who work under the Department of Streets and Sanitation’s Bureau of Traffic Services. Additional millions of dollars are spent on booting program costs and salaries. The most notable portions on the revenue side of the equation are storage and booting fees. Booting fees ($5.6 million) single-handedly account for the city staying in the black in 2017. But boot and storage fees are problematic because they are a step removed from policies and enforcement meant to deter illegal or bad behavior. By definition, “add-on” charges to tickets ensnare people who have already run afoul of the law in some way and either won’t (or can’t) pay up. According to social justice groups, booting and impound fees amount to strident debt collection that hits poorer residents especially hard. As WBEZ and ProPublica Illinois have reported, data suggest Castaldi’s right. Much of the debt that drivers build up from tickets, tows, car bootings, storage fees and late penalties never gets paid. The trend translates into higher numbers of bankruptcies. It’s going to get harder for the city to keep its towing and booting programs in the black without raising fines and collecting on debts even more aggressively. The towing contract is slated for renewal in 2021, and URT (or another vendor) may force an increase in tow fees. City employee salaries and benefits are unlikely to drop. It’s unlikely that a city losing its middle class will increase the number of residents able to pay tickets and related fees. Chicago could be running out of time to retool its towing practices, and the pressures are not just financial. For one, the city is electing a new mayor tomorrow, and both candidates have called for ticketing and towing reforms, even if the changes bring the city less money. The city’s new mayor will negotiate the 2021 towing contract and appoint the commissioners who decide how and when to tow cars. There’s political movement on the issue in other corners of City Hall, too. In February, Anna Valencia retained her elected city clerk position, which she had used to launch a task force to examine city ticketing and debt. In December, Valencia said she expects the task force to find policy recommendations to collect revenue more responsibly. “We cannot piecemeal legislate our way out of this,” she said. Ald. Gilbert Villegas of the Northwest Side’s 36th Ward has proposed capping late penalties and cutting impound fees. His legislation would also donate unclaimed vehicles to non-profits, a move that could crimp any towing contractor’s bottom line. His legislation is stalled for now, but he’s still involved in the Clerk’s task force. Regardless, the new mayor, be it Toni Preckwinkle or Lori Lightfoot, may also feel legal pressure to address the issue in the wake of the Supreme Court decision on excessive fines, as lawsuits are sometimes the only thing that compels the city (or mayor) to steer a different course. Jacie Zolna, a lawyer for Myron M. Cherry & Associates, is responsible for lawsuits on excessive fines and duplicate ticketing for city stickers and license plates. His suit on tickets for red-light cameras forced the city into a $38.5 million settlement in 2017. He calls red-light cameras and tickets the city’s golden goose. “It will stop at nothing to collect that money even from our most vulnerable citizens and even when its actions by any objective measure are morally reprehensible,” he said. Elliott Ramos is an editor who does data reporting for WBEZ. Follow him @ChicagoEl or email him at eramos@wbez.org. We are providing a refined set of those records for the public to search, use and share. Scofflaw storage fees and boot fee information is also available. Vehicle scrap values were calculated using two sources. First, we obtained scrap price tables through public records requests to Streets and Sanitation. We matched monthly scrap valuations with contract sales dates listed in the towing data. We then obtained vehicle identification number (VINs) for scofflaw vehicles with tows. We decoded the vehicles’ models, series and years using the National Highway Traffic Safety Administration website. That data was corroborated through samples of registration information to the Illinois Secretary of State’s office, which then returned other data points, including makes, models and years. Data for indebted scofflaw vehicles was accomplished using booting data obtained through public information requests to Chicago’s Department of Finance. Salaries and overtime information for city employees involved in the towing program were obtained from the Department of Human Resource via the city’s public data portal. Impound costs were determined using invoices obtained through records requests to Streets and Sanitation for each month from 2013-2018. Additional payment records were obtained through another records request to the Finance Department; these account for scofflaw boot release-and-tows. Airport booting program costs were obtained through invoices supplied by the Department of Finance and Department of Aviation. The monthly number of boots for Midway and O&apos;Hare Airports were added to the baseline fees established in the 2017 contract available from Chicago’s Department of Procurement. The vehicle valuations of cars sold were determined by decoding the VIN of vehicles identified as being sold in a “contract sale,” and establishing the year, make and model of the cars. That allowed us to create a list of unique cars passing through the sales program. That list was sent to the National Automobile Dealers Association, a private vehicle valuation company owned by JD Power and Associates. Valuations assume a conservative 15,000 miles per year of age per vehicle. Car sales experts said the industry standard is to assume a range of 12,000 to 15,000 mileage per year in service on used cars. Valuations were not available on vehicles older than 1998. As the values of the cars at that age are close to the scrap value, the monthly scrap value Chicago paid to URT was used on cars older than 1998. While the individual valuations of the cars are proprietary licensed information to NADA, we were able to sum the individual valuations of cars newer than 1998 and the scrap values of the older cars, with an estimated $22 million valuation of cars sold in 2017. Asset forfeiture data was obtained through a public records request to the Cook County State&apos;s Attorney’s office. Plate information was not available, but VINs were matched against those of towing records. Those sales were done via the city’s Department of Procurement Services auction website. The lot totals and revenue were provided by Procurement via another records request. Police impound data was obtained through a records request to the Chicago Police Department to determine vehicle fees. Plates were not available, but VINs were matched against towing records. Administrative hearings records for VIP tows were obtained through a public records request to the Department of Administrative Hearings. Docket numbers were matched against an index of case types (also obtained through are records request to the department) matching “VIP.” Fines and fees were assessed utilizing Department of Finance data from a separate database called Automated Referral Management System (ARMS). Fines and interest collected were determined by matching VIP cases against matching docket numbers. The resulting data show all administrative hearings cases between 2001-2017 with associated fees. Salaries and overtimes for city employees involved in the towing program were calculated from Department of Human Resource data obtained through the public data portal. Headcounts of bureaus of departments were determined using salaried employees designated in the mayor’s 2018 and 2017 budget appropriation overviews. Health benefits and pension contributions were estimated from the “Fringe Benefits Letter” issued by Department of Finance to agency heads via a 2016 memorandum. That letter, obtained through a public records request, also included price tables of benefits for employees. At the recommendation of Office of the Inspector General, a blanket 40 percent of salaries was applied to city employees. Pricing for the towing was assessed using price tables in contracts via the Department of Procurement website for 2010 and 2016. Settlements for wrongfully damaged vehicles were assessed using data obtained from public records requests to the Department of Law. WBEZ would like to extend thanks for cooperation from the Chicago Departments of Streets and Sanitation, Finance, Budget Management, Procurement Services, Law, Human Resources, Fleet and Facility Management, and Police; and the offices of the City Clerk of Chicago, the Illinois Secretary of State, Illinois Attorney General Public Access Counselor for data and responding to more than 100 FOIA Requests. Additional thanks to Communities Organizing and Family Issues and the Chicago Jobs Council for background research.